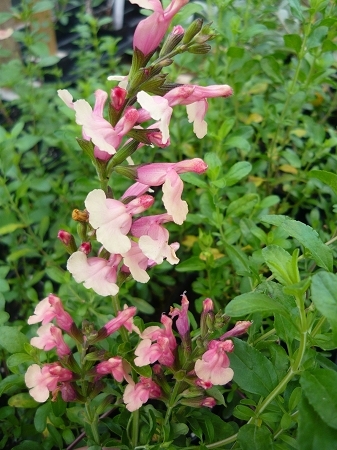 Sierra San Antonio Salvia (s. jamensis) - Beautiful coral colored blooms are a hummingbird favorite. Very drought tolerant with low water requirements once established. Reported to be deer resistant. Forms a small bush approx. 3' x 3' blooms continuously Spring through late Fall. Perennial zones 7-10. Live plant in 3 inch container. My plants arrived quickly and in great condition. So far the Sierra San Antonio Salvia is my favorite. It has grown quickly and is already blooming. I love the color of the flowers so much that I ordered another one.